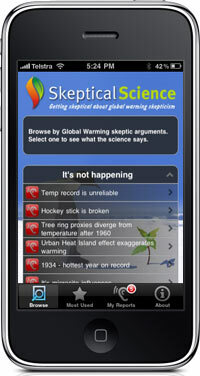 Skeptical Science is now available as a free app for the iPhone or iPod. 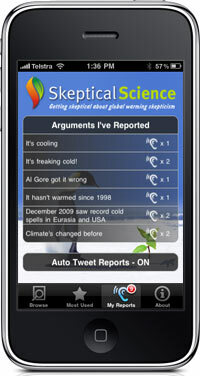 You can now use an iPhone or iPad to view the entire list of skeptic arguments as well as (more importantly) readily access what the science says on each argument. 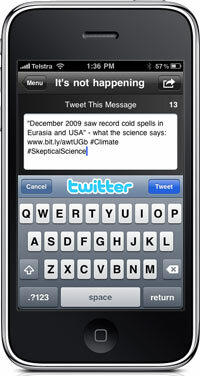 The app connects to the website regularly so when new skeptic arguments, recent research or the latest data is added, the app automatically updates also. 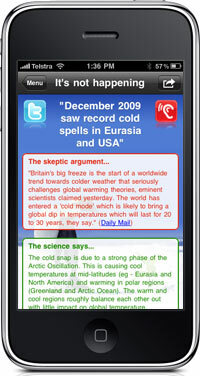 To download the free app, go to https://itunes.apple.com/de/app/skeptical-science/id353938484?mt=8. 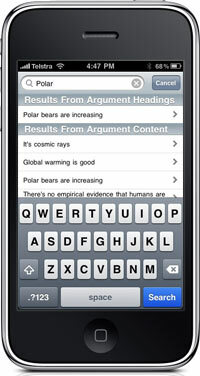 The app lets you browse arguments via the Top 10 most used arguments as well as 3 main categories ("It's not happening", "It's not us", "It's not bad"). Note also the search button - more on this shortly. There are many graphs and figures displayed throughout the app. 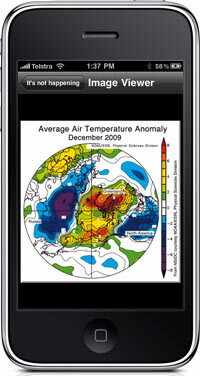 One limitation of the iPhone is the small size these graphs are displayed. However, if you press any graph, it opens it in an Image Viewer. Here, you can rotate and expand the image to get a closer look. A novel inclusion is a feature that lets you report when you encounter a skeptic argument. By clicking on the red ear icon (above left, shown to the left of the skeptic arguments or above right, next to the headline), the iPhone adds another hit to that particular skeptic argument. You can view which arguments you've reported via the My Reports page, shown below. Currently, the app doesn't show which arguments have been reported the most via the iPhone app but you can get a sneak preview of the results via the iPhone results page. 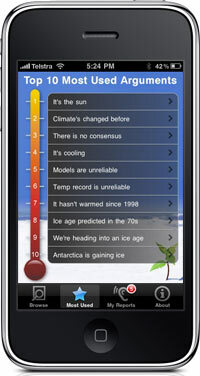 If you think the Skeptical Science iPhone app might be useful to others, you're very welcome to add an icon of the iPhone app on your website or blog. There are several different sized icons to choose from plus HTML to just copy and paste onto your website if you wish. The icons are transparent gifs with hard pixel edges so they'll work on any coloured background. 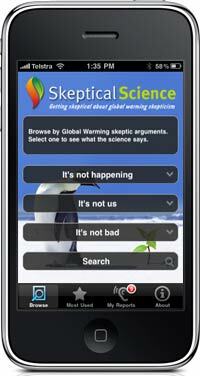 If anyone has any problems or requests regarding the Skeptical Science app, please contact me.